A detail from an embroidered accessory, exhibited in my Pop Up Studio at the Compton Verney Textile Fair, November 2015. Stitches of golden threads reference the ‘Going for Gold’ mood boards (see Oct. blog); the design is influenced by Dan Pearson’s ‘Wild Flower Meadow’, that he created for Compton Verney last summer. I intended showing this pre Christmas in my November blog, but commissions and lots of stitching took over! 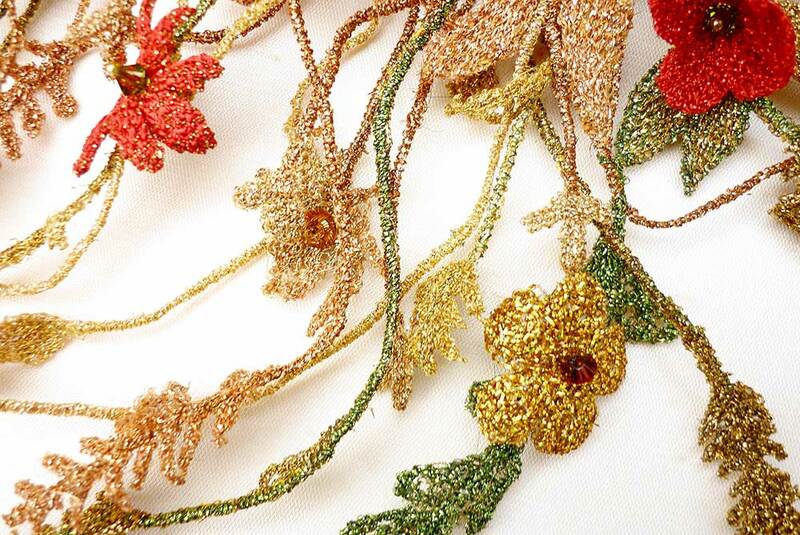 But perhaps a dose of sparkle in chilly January is a perfect tonic to inspire creative embroidery. Textures of grasses, wild flowers influence the patterns of machine stitching; instead of the naturalistic palette of the meadow, I chose to enrich the flora with metallic threads. Techniques explore machine lace details and decorative cords using metallic stitchery, all accents with a twinkle of Swarovski crystals and glass beads. This decorative accessory is almost complete, soon to be photographed by Michael Wicks for my next book. 2016 promises to be busy in my textile studio, as I make more creations for this new publication. Follow my blog diary for the latest news on my forthcoming book.